This interview is part of an ongoing series where we talk with a variety of people in the Drupal community about the work they do. Each interview focuses on a particular Drupal role, and asks the individuals about their work, tools they use, and advice for others starting in that role. You can read all of these interviews under this list of Drupal roles posts. Interested in learning how to become a Drupal developer, too? Check out our role-based learning pathway: Become a Drupal Developer. 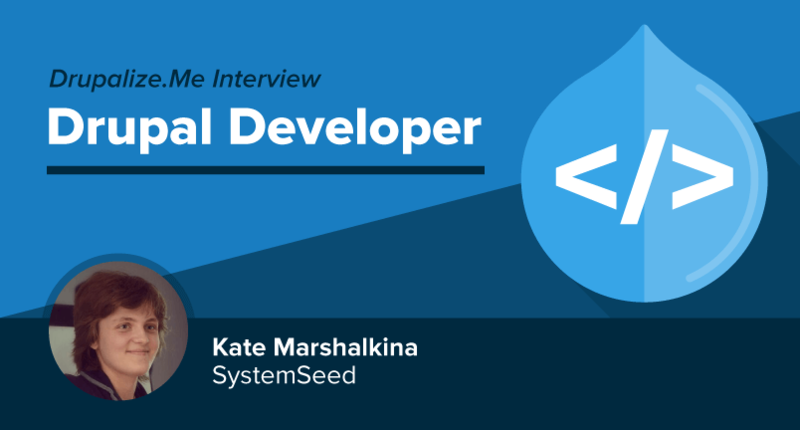 Kate is a senior developer at SystemSeed, based in Moscow, Russia. She understands the importance of community and continuing education to keep her skills sharp coding Drupal modules, maintaining her development environment, and keeping up with the latest technology trends and information. How do you define the Drupal developer role? It's a tricky question. Instead of working on something alone, I usually first ask the community for help. Fortunately, Blair Wadman wrote a detailed answer to the question “What is a Drupal developer?” In short, a Drupal developer is the one who can write some code if there’s no module for that. At a minimum, this position requires some experience in Drupal 7 module development, and a general understanding of web stack. What do you currently do for work? What does your daily routine and work process look like? What kind of tasks do you do on a daily basis? I’ve thought about buying a pair of scientific glasses because most of the time, I do research. Every developer task starts with an investigation of different solutions, reading articles and source code, estimation, and tech concept. After these steps are complete, I start the “real” development. However, in SystemSeed, I'm involved in all processes from DevOps to QA. This approach makes me really excited about my daily routines. It requires continuous self-improvement in wide range of skills, in addition to Drupal development. What do others look to you to do on a project? Every time I flip through “The Pragmatic Programmer”, I realize I’m the worst programmer in the world. Perhaps that's my strongest skill—to remember that the learning curve never ends. I’ve been addicted to web development for as long as I can remember. However, my experience with Drupal is not as long. The first version I installed was Drupal 7.4. A short time after that, I was hired by a security startup to build internal Drupal distribution and websites for a couple of company products. I was impressed by the amount of free learning resources and the community behind it. At the beginning, I spent a lot of time on Drupal Answers, helping people and learning different aspects of Drupal. Later, I became more involved on Drupal.org, writing patches and working on contrib modules. Of course, it was a long journey, but I personally think the “Drupal learning curve” myth is a bit overstated. Any new technology takes a decent amount of time to learn. What is most challenging about being a Drupal developer? To be honest, I’m a very happy Drupal developer. I enjoy new technical challenges, and I’m really excited about the upcoming Drupal 8 release. The most challenging part of my work is to align development and business goals. Solving real-life problems is much more challenging than just delivering a technically perfect piece of code. What are your favorite tools and resources to help you do your work? My current local environment seems to be quite complex; virtual machines, a couple of text editors, terminal with tons of utilities and an IDE with a sophisticated hotkeys configuration. I would like to make my dev environment as simple as possible. I don’t think I’ll end up with one huge .vimrc instead of all these tools. I’ll more likely switch to Web IDE some day, so there will be only two applications launched; the browser, and iTunes. As far as learning resources, Drupal Planet is the best place for me. I usually look through it in my spare time and go back to read the details if I work on something similar. If you were starting out as a Drupal developer all over again, is there anything you would do differently? I would write more blog posts. It’s a great way to learn the topic thoroughly, and make new contacts in the community. What advice do you have for someone just starting out as a Drupal developer? Read code—core, modules, patches, plugins, whatever you are working with. Write code. Go to issue queues, and help with patches and reviews. Share your modules on Drupal.org or Github to get code reviews “for free”. Well said and well written. Proud to know Kate in person.